Guy Boucher needed around about two days to decline the Blue Jackets' offer. Scott Arniel needed about two hours to accept it. Scott Arniel is set to become the fifth head coach in Columbus Blue Jackets. No false alarms this time. Blue Jackets general manager Scott Howson will introduce the new head coach tomorrow at a press conference scheduled for 3 p.m. at Nationwide Arena. Arniel accepted the CBJ coaching gig shortly after first choice Guy Boucher turned down an offer to take over the reigns. He has spent the last four seasons coaching the Manitoba Moose of the American Hockey League, where he compiled a record of 181-106-0-33. Last season he won the Louis A.R. 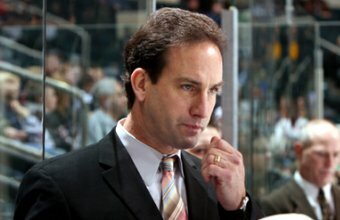 Pieri Memorial Award as the top coach in the AHL. His Moose made it to the Calder Cup before falling in Hershey Bears in six games. Working on a full story. Check back later for updates.